Sim children - now with 40% more fun! I get awfully tired of my sims living in a world where nobody ever gets dirty, messy, or even slightly mussed. Especially so with children! Real kids get their clothes a total mess, and it's not long before every pair of pants is torn out at the knee. So, inspired by my own son's complete disaster of a wardrobe (and the cute patches I've been making to mend things), here's a set of five pants in various stages of child-like disarray. These are everyday, casual clothing items, and are unisex, for boys and girls. 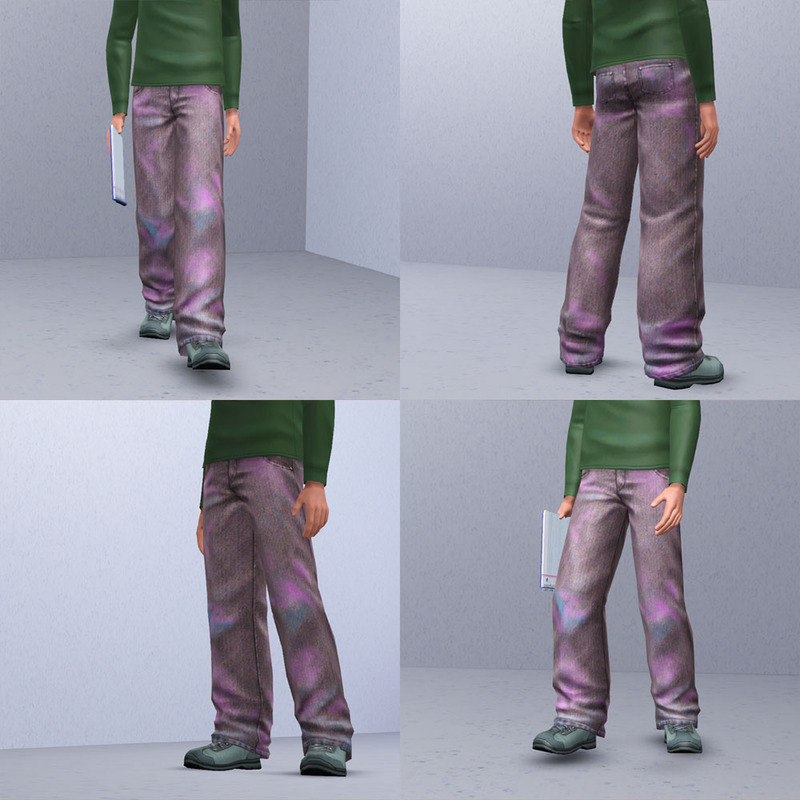 They take up only one line in CAS - the first one in the set is the worn knees. 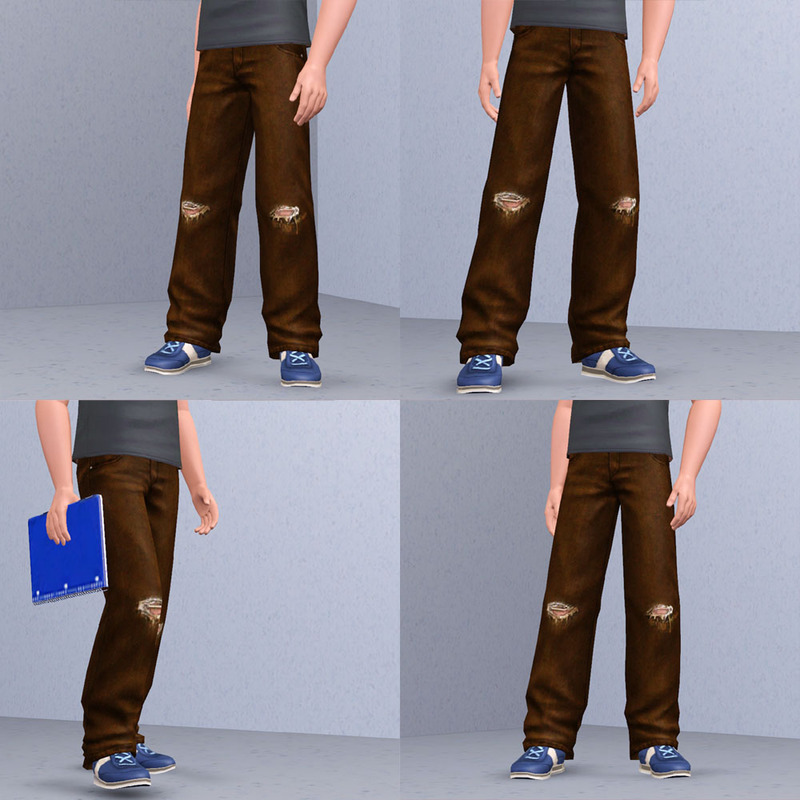 No EP is required but the denim texture used for them is in one of the patches, so make sure your game is patched. 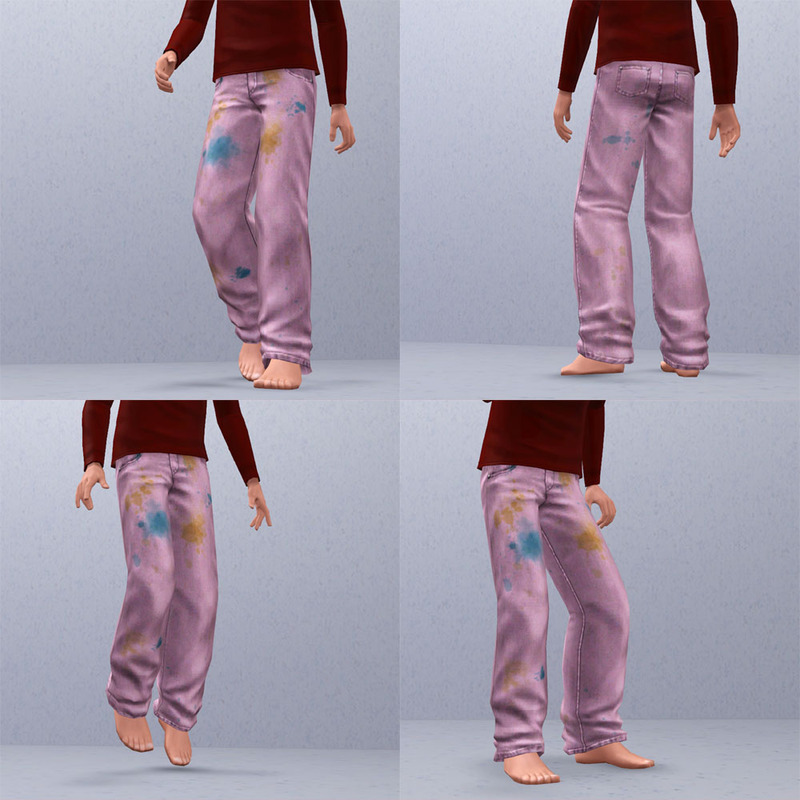 These are identical in texture to a pair of default kids' pants from the base game, so you can easily use them in stories/movies for a scene where a kid starts off clean and then gets dirty or whatever. Worn Knees - Both knees torn and frayed from rough-and-tumble play, these pants are still comfy, but a little worse for wear. One channel only. Paint Splatters - Art time usually results in a complete mess, with paint almost everywhere but on the paper! Three channels - cloth, and two paint colours. Chalk Smudges - An afternoon spent drawing on the pavement is super fun, and makes for a very artistic looking effect on one's pants. Three channels - cloth, and two chalk colours. Try setting the chalk colours to brown or green to make for great dirt or grass stains, too! 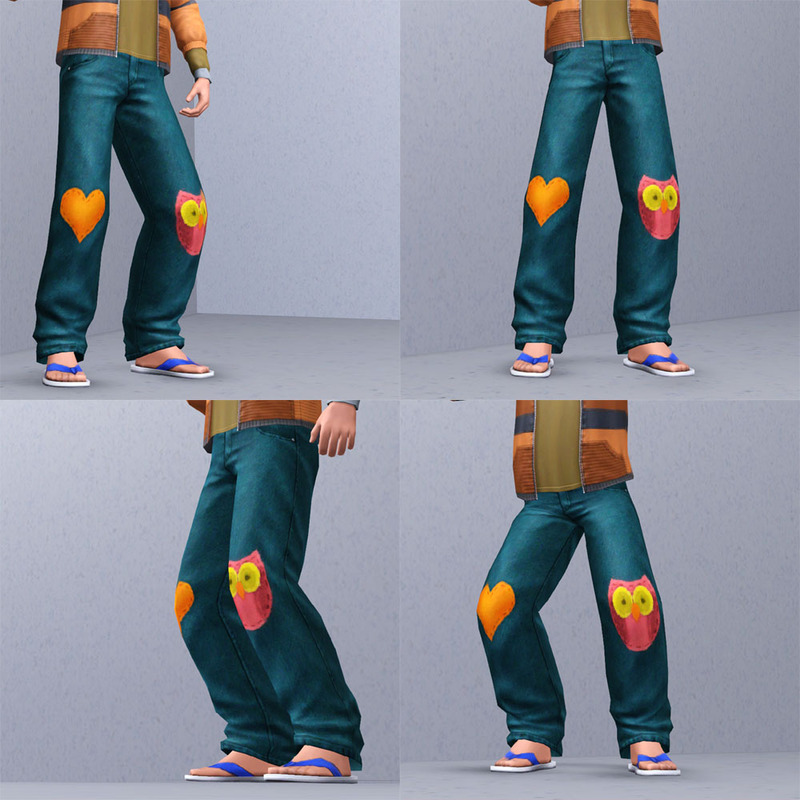 You Obviously Love Owls Patched - Once the knees are busted out, the fun solution for kids and parents is fun patches! One heart, and one cute owl! Four channels - cloth, heart/beak, owl's eyes, owl's body. 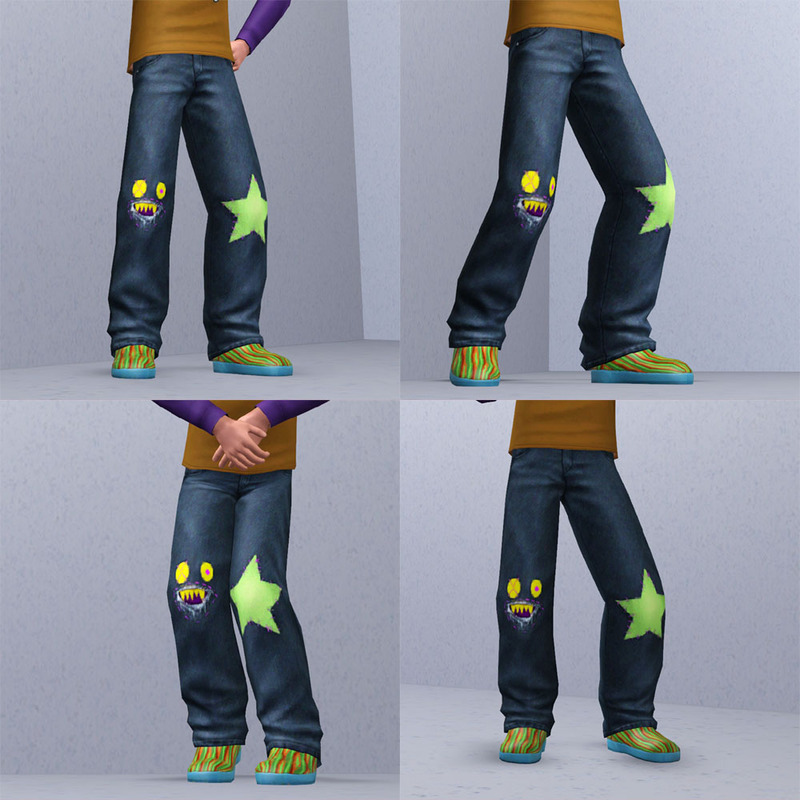 Monster Star Patched - My kid has these actual pants, and was gleeful when he saw I'd made them for sims! 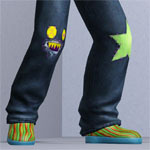 Monster peeking out the torn knee on one leg, star on the other. Four channels - Cloth, star, monster's eyes/teeth, stitching/inside of monster's mouth. TSRW for the great program, whiterider for tips, folks in the Create chat for encouragement, and my son, for being an awesome and inspiringly artistic little kid.